Director’s Blog: How much hotter can it get? Spending August in the Arava Valley, enjoying temperatures which range from 82ºF at night to 105ºF during the day, motivate one to ponder climate change and ask the question “How much hotter can it get? !” A recently published report by the National Oceanographic and Atmospheric Administration (NOAA) revealed that May 2016 was “the 13th consecutive warmest month on record”. While some US candidates for political office consider climate change a hoax perpetrated by the US’s trade competitors, for those of us whose brain has not been partially devoured by alien ants, climate change is a real thing. The most recent report by the Intergovernmental Panel on Climate Change (IPCC), put together by the world’s best scientific minds on this issue, is not a fun read. The scenarios range from bad to really bad. By the end of this century, the scenario based on stringent mitigation worldwide predicts a rise in temperature from between 0.3ºC to 1.7ºC (0.5ºF to 3.0ºF). The other more likely scenarios predict higher temperature increases. The report goes on to say: “Surface temperature is projected to rise over the 21st century under all assessed emission scenarios. It is very likely that heat waves will occur more often and last longer, and that extreme precipitation events will become more intense and frequent in many regions. The ocean will continue to warm and acidify, and global mean sea level to rise.” (IPCC 5th Assessment Report 2014). The impact of humanity on climate change and the impact of climate change is also definitive; “Human influence on the climate system is clear, and recent anthropogenic emissions of greenhouse gases are the highest in history. Recent climate changes have had widespread impacts on human and natural systems.” (IPCC Report). The Middle East is already a really hot, dry place to live. Should we be that concerned about climate change in this part of the world? Jacob Powell reports, on the Middle East Eye website, on a study by NASA which found that Israel, Palestine, Jordan, Lebanon and Syria, known as the Levant Region, are suffering from the worst drought in 900 years as a result of climate change. 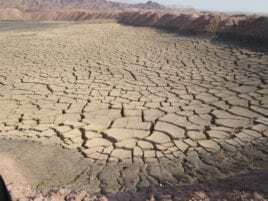 The article tells us that some analysts believe climate change and severe drought are part of the cause of political unrest in the Middle East and North Africa. Powell quotes Francesco Femia from The Center for Climate and Security: “…climate change, in conjunction with bad governance, led to a large displacement of people and helped instigate the Arab Spring and the Syrian revolution.” Dr. Dan Tamir, faculty member of the Arava Institute, in a recent talk he gave to the Institute’s Israeli Public Council, explained that the Syrian government policy of heavily subsidizing water for farmers encouraged agriculture based on water intensive crops like cotton and wheat. When the drought hit, the agricultural economy of the western rural part of Syria collapsed and mass migration took place east to the urban centers. ISIS took advantage of the turmoil and the mass evacuation to take control of western Syria while the increase in the population of urban centers in the east, like Homs, Aleppo and Damascus, created pressure on resources, high unemployment and tribal and religious conflict. Israel and its neighbors’ contribution to climate change may not be large compared to that of the US, China, Russia and other large industrial nations around the world but that does not mean climate change is not something we need to be concerned about. Civil unrest is rampant in the Arab world and most experts agree that climate change generated drought has been a contributing factor along with failed governance, a lack of civil rights and tribal and religious conflicts. Just recently, a heat wave combined with politics created a flare up between Israel and the Palestinian Authority over water scarcity. Though it is unlikely that climate change will have the kind of political impact on Israel that it is having on its neighbors, due to strong democratic institutions, technological prowess and social cohesiveness, even Israel will begin to feel the impact of climate change when average temperatures continue to rise and Israel’s deserts expand north, shrinking the Mediterranean climate zone along the coast and the north, causing a loss to Israel’s rich biodiversity. Eldridge Cleaver told us that if we are not part of the solution then we are part of the problem. Israel leads the world in waste water treatment, desalination and drip irrigation. Israeli green entrepreneurs are pushing Israel into the renewable energy age. Sustainable water use management and reduction in dependence on fossil fuel are two key elements in adapting to climate change. Such adaption and mitigation policies will benefit from cross-border cooperation and coordination between Israel and her neighbors. On September 7th and 8th, the Arava Institute, as part of its 5 year strategic vision to advance cross-border environmental cooperation agreements, will convene its first annual Cross-border Environmental Cooperation Conference, bringing together Israeli, Palestinian and Jordanian experts and policy makers. The conference will include a round table discussion on climate change and how the three neighbors can coordinate policy, scientific research, natural resource management and technology transfer in order to help steer the world towards a climate change scenario we can all live with.